The rich, old-fashioned flavor of this cheerful pie will remind you of summers at Grandma's. 1. In a large saucepan over medium heat, scald the milk. In another large saucepan, combine the sugar, cornstarch (or flour) and salt. Gradually stir in the scalded milk. 2. Over medium heat, stirring constantly, cook until thickened. Lower heat slightly, then cover and cook for 2 minutes longer, stirring occasionally. 3. Slowly pour a small amount (about 1/2 cup) of the hot milk mixture into the egg yolks, stirring constantly. When egg yolk mixture is thoroughly combined, pour it slowly back into the pan of hot milk, again stirring constantly. (This keeps the eggs from scrambling and getting lumpy). 4. Cook one minute longer, stirring constantly. Remove from heat and stir in the butter and vanilla. Stir gently until butter is melted into the pudding. Let pudding cool in pan until lukewarm. 5. When custard is cool and ready to pour, slice bananas and layer evenly across bottom of pie crust. Pour the lukewarm custard over banana slices. 6. Top pie as desired with meringue or fresh whipped cream. Refrigerate leftovers. Cook's notes: The directions in Step 1 say to scald the milk. Scalded milk is an important flavor and aroma element in old fashioned recipes. Scalding milk is bringing it just to the edge of a boil. The edges will bubble, and the milk will have steam rising off the top of it. In "How to Scald Milk", Holly Quinn notes, "Scalding milk is not necessary for health reasons as it was in the olden days, when it was done primarily to destroy bacteria. Today's modern pasteurization takes care of that. But scalded milk can make a slight difference in the taste and texture of baked items and custards--if you haven't quite been able to copy one of grandma's recipes exactly, scalded milk could be what's missing." Pie filling recipe from Dallas Morning News archives. Old Fashioned Banana Cream Pie may have been taken to some of these fun parties! Loved your recipe and definitely look forward to seeing future additions!! Joy, You always have the most beautiful pies! Of course, you have me inspired to make a banana cream pie, and I will be doing that is soon as we get back from our weekend! This looks divine! I live in Italy and I keep telling my husband about Banana Cream Pie - so now I have the perfect recipe to make it! Thanks so much for linking up to the Handmade Hangout!! A beautiful pie and I haven't had banana cream pie forever! When you are talking about scaled milk I can just smell it - they should make a candle with scaled milk smell!! Stopping by from the Cookie Puzzle Party. I LOVE banana cream pie but haven't found a recipe I liked yet. This could be it! Old fashioned and custardy. Looking forward to making this one next week alongside a homemade cherry pie for a Bbq. I am sure it will be a rousing success! I love banana cream pie too. I could put this vanilla cream on anything and everything. YUM! Hi Joy...this looks delish!!! Thanks so much for sharing your recipe! This is yummy! Thank you for sharing with us at the #WWDParty - Happy Summer Solstice 2014! Thanks for the scalded milk tip, Joy! This pie would put me right in foodie heaven!! This pie looks so yummy. Thanks for sharing at the Snickerdoodle Sunday. Pinning this looks so simple and delicious. My husband loves banana desserts. I'll have to make this for him this summer. Thank you for swinging by and linking, Joy! I'm definitely giving this a try. One, it sounds so much easier than my current recipe. Two, it includes whole milk...my husband will think he's died & gone to Heaven! What a gorgeous looking pie! I can't wait to try this. Banana cream pie is one of my faves...will be trying your recipe for sure! This pie looks soo yummy. I am excited to try it because it features ingredients I can actually find here in Brazil....yay:) pinning to try soon. Have a great night Joy. Banana cream pie will be served in heaven--I'm sure of it! 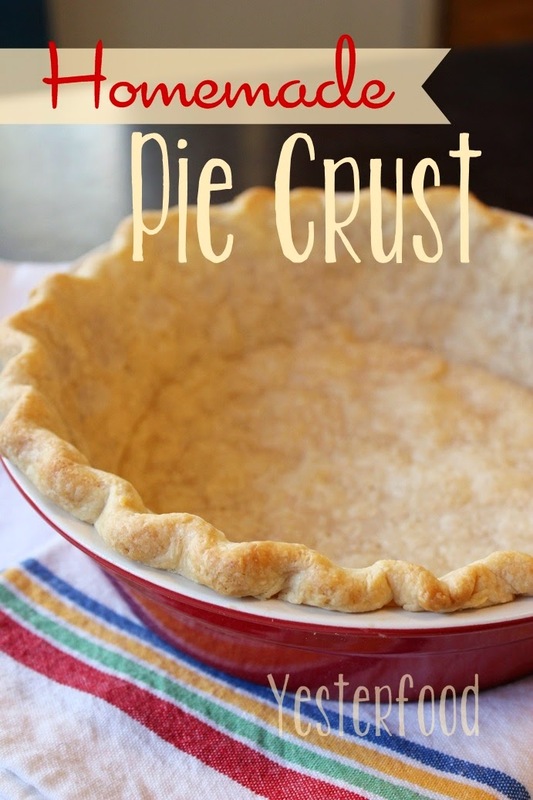 Can't wait to try this with your coconut oil pie crust (which you KNOW I love!) :) ! What a beautiful recipe Joy. This looks and sounds absolutely delicious Joy :) Beautiful photographs too! I love this old fashioned banana cream pie recipe. It's so delicious and everyone loves it. Pinned/shared. I have been looking for a banana cream pie recipe - this one looks so good! Pinning to try this weekend. Yes, this does bring back memories!! Just a lovely pie!! Pinned and will be sharing on FB!! This looks so delicious Joy! My dad loves homemade banana pudding, and this looks just as great - maybe even better. I'll plan to make it for him the next time we have him over (and maybe even try it out on my family first! :) ). Thanks so much for sharing. Pinning! That looks delicious! Thank you for joining us on the Wake Up Wednesday Link Party! Have a great day! Good Afternoon Joy, I have never eaten Banana Cream Pie, but I do love bananas, so I shall certainly be making this pie in the near future. Aw this looks lovely! I'd love a piece right about now! This looks SO delish, Joy! Thank you bunches for linking up and partying with us! I love a classic recipe - this banana cream pie looks heavenly. Saving this recipe. My favorite - I haven't had banana cream pie for years. Your recipe looks easy and delicious. I will think of this pie all day...it looks scrumptious! Thanks for sharing on the Thursday Blog Hop! I need to make this for my dad! He will love it!!! Thanks for sharing at Happiness is Homemade Linky, you are being featured on Sunday so stop on over and grab our button!!! Yum!! I'm not a great baker, but this recipe looks too good not to give it a try!! Thanks so much for sharing and for linking up at Cook it! Craft it! Share it! Party last night!! Have a great weekend! This pie takes me back to my childhood when my mother made a Banana Cream Pie, your pie looks delicious! Hope you have a great weekend and thank you so much for sharing with Full Plate Thursday! Oh, my! This does look divine, indeed! I love any kind of banana dessert. Thanks so much for linking up to my Creative Ways Link Party! Hope to see you again this week! This is the exact same recipe that I have from my mother in law. I also use it for Coconut Cream Pie. It is delicious! Thanks for sharing with SYC. I am forever buying bananas, and then not eating them. On the last possible day, I make bread with them before they explode. So tired of that recipe - but now I have this one! Thank you! And thank you for explaining scalded milk. I always wondered about the benefit of that procedure! Can't help myself. I gotta feature this one at next weekend's Saturday Dishes. THANK YOU!!! This looks like it is right out of an heirloom recipe book! Yum! I love that your using whole milk too! I think I'm in love with this pie! I'm so looking forward to making it! Great clicks! These are making me hungry right now.